Eight years ago, Mary and Freddy Gale's young daughter was killed by a drunk driver on her way home from school. The driver, a young man named John Booth, was sentenced to eight years in prison. Unable to absolve their own guilt, the Gale's marriage dissolves and Mary takes their two remaining children away from Freddy. Quenching his thirst for vengeance with alcohol, Freddy Gale waits for John Booth's release, planning his revenge. He becomes a man obsessed. On the day of John Booth's release, with his soul howling in agony, he is ready. John Booth, at once strengthened and weakened by his prison experiences, also waits. Still seeking a final penance, John Booth endures his own agonies until the day he gets a gun to reclaim his life. It is not surprising that the characters of this novel have the voices from a finely tuned play; the author wrote Streamers, Sticks and Bones, and Hurlyburly, each an exploration of the often violent conflicts in the American psyche. 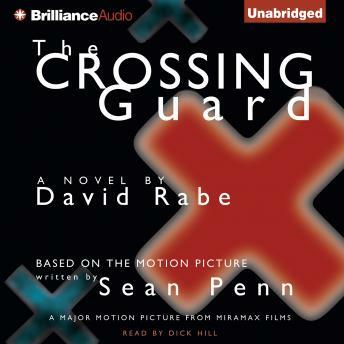 The Crossing Guard is based on the Miramax film written and directed by Sean Penn and starring Jack Nicholson, David Morse, and Angelica Huston.